Just after 7 a.m. the driver stopped his car on the lower level of the bridge, where there is no pedestrian walkway, only a maintenance catwalk and a barricade-height railing. He quickly climbed over the railing and jumped into space and his death. Later retrieved from the water far below, the body was identified as that of a 38-year-old man from Queens. This was the fifteenth suicide on the bridge for 2017, three more than in 2016, but three less than in 2015. The bridge in question is the George Washington Bridge, spanning the Hudson River and joining Washington Heights, Manhattan, to Fort Lee, New Jersey: a magnificent double-decked suspension bridge dating from 1931 that I have walked many times on the upper level, a heavily trafficked span whose constant din of traffic has not kept me from gazing in awe at the towers soaring high above me and at the steel harp of the cables, or kept me from looking dizzily down into empty space and, far below, the waters of the Hudson, splashed on sunny days with dots or streaks of silver. Just looking down for a moment makes my legs go weak, so scary and yet fascinating is that vertiginous drop. And when I reach either end of the bridge and feel terra firma under me again, I always feel a bit of relief. The George Washington Bridge rivals the Empire State Building, and the Golden Gate bridge in San Francisco, as a preferred site for suicide attempts. An attempt is thwarted on the bridge about every five days, for a total of 68 “saves” in 2017 as of November last. Port Authority officers train cameras on the pedestrian walkway, and if they see someone lingering too close to the railing for a bit too long, they can dispatch a fully equipped emergency unit to prevent the attempt. In addition to the 68 “saves,” 37 possible attempts were thwarted when officers, forewarned by someone, stopped the presumed suiciders before they even reached the bridge. But officers can’t prevent every attempt, as the total of 15 suicides for 2017 attests, so a new preventive is being installed: an 11-foot-high fence connected to netting that forms a canopy over the pedestrian walkway. This is a much more formidable obstacle than the barricade-height railing already in place; to get past it would take time and effort, giving the officers more time to intervene. According to suicidologists (yes, there really is such a word, though my spell check doubts it), barriers on bridges are effective in reducing rates of death by suicide. So more power to the barriers, and if you ever take a walk across the bridge (which I highly recommend), just don’t linger long by the railing. Source note: This article was inspired by an article by James Barron in the New York Times of December 30, 2017. It bursts upon the scene. Fans want to attend it, consumers want to buy it, investors want to invest in it before word gets around. It excites, it maddens, it intoxicates. Above all, it is something startlingly new, astonishingly different. And it can make the world better … or worse. No, don’t mean the entrepreneur-led charitable foundation of that name that seeks to empower young entrepreneurs to take on the world, admirable a goal as that is. Nor do I mean any number of novels and high-tech gadgets and other stuff marketed online as “the next big thing.” I mean a rich variety of break-through inventions, styles, fashions, and fads that swept New York and the nation, if not the world, changing, or seeming to change, the way we live. Let’s have a look at ten of them. In 1807 Robert Fulton’s pioneer North River Steamboat, later rechristened the Clermont, made the round trip on the Hudson River from New York to Albany and back in an amazing 32 hours. Amazing because, prior to this, the Hudson River sloops, sailing upstream against the current and often against wind and tide as well, took as much as three days just to get to Albany. Steamboats revolutionized traffic on the waterways of America and the world, bringing distant places closer together and, in New York State, letting New York City legislators get to the state capital expeditiously, so they could pursue their legislative schemes and stratagems, and try to keep upstate lawmakers, whom they termed “hayseeds,” from neglecting or abusing their beloved Babylon on the Hudson. Steamboats on the Hudson at the Highlands. A Currier & Ives print of 1874. Promoted shrewdly and outrageously by P. T. Barnum, the master of humbug, the Swedish coloratura became a sensation in America. Citizens who knew little or nothing about coloratura sopranos suddenly felt an intense need to hear the Swedish Nightingale warble her magical notes. Thousands thronged the piers to witness her arrival on September 1, some of them suffering bruises and bloody noses in the process; a fatal crush was narrowly avoided. To get her through the crowd, Barnum’s coachman had to clear the way with his whip. As for her first performance on September 11 at Castle Garden on the Battery, she astonished the packed audience with her vocal feats. All tickets having been sold already at auction, some without tickets hired rowboats and rowed out into the harbor to hear her from there, faintly but distinctly. When news reached these shores that Eugénie, the Empress of the French, had adopted a new style of dress, the hoopskirt, averaging some three yards in width, the fashionable women of New York and the nation simply had to add this marvel of technology to their wardrobe, and the factories of New York bustled and hummed accordingly, turning out up to four thousand a day. For the next ten years or so, the ladies labored to maneuver through narrow doorways, and to sit gently and comfortably, in these cagelike monstrosities of fashion, until word came that the Empress of the French now favored quite another style, the bustle, which spelled the end of the hoopskirt. An 1856 cutaway view from Punch. It opened on September 12 at Niblo’s Garden, a huge theater on Broadway, and ran for a record 474 performances: a heady brew of a melodrama with a scheming villain who contracted to sell souls to the devil in exchange for magical powers. An extravaganza of extravaganzas with a hodgepodge of a plot, it featured a kidnapped heroine to be rescued by a hero; a fairy queen who appeared as a dove and was rescued from a serpent; a grotto with swans, nymphs, and sea gods that rose magically out of the floor; a devil appearing and disappearing in bursts of red light; fairies lolling on silver couches in a silver rain; angels dropping from the clouds in gilded chariots; a “baby ballet” with children; a fife and drum corps; the raucous explosion of a cancan with two hundred shapely legs kicking high, then exposing their frothy underthings and gauze-clad derrieres. When, at the end of the five-hour spectacle, the cast took their curtain calls before a wildly applauding audience, they were cheered by leering old men in the three front rows who pelted them with roses. Denounced from pulpits as “devilish heathen orgies” and “sins of Babylon,” it was a long-time smashing success, revived often on Broadway and touring the country for years. Some see it as the origin of both the Broadway musical and burlesque. An 1866 poster. For spectacle, even the Met Opera today couldn't match it. At 3:00 p.m. on September 4, 1882, Thomas Edison flicked a switch at his Pearl Street power plant in downtown Manhattan, suddenly illuminating the Stock Exchange, the offices of the nation’s largest newspapers, and certain private residences, including that of financial mogul J.P. Morgan. “I have accomplished all that I promised,” announced the Wizard of Menlo Park. A young inventor already credited with the invention of the phonograph, Edison had demonstrated his new incandescent light bulb to potential backers in December 1879, and subsequently to the public. “When I am through,” he told the press, “only the rich will be able to afford candles.” Impressed, wealthy patrons such as Morgan and the Vanderbilts had invested in the enterprise. At his research laboratory in Menlo Park, New Jersey, Edison and his team worked diligently to develop and patent the basic equipment needed, including six steam-powered dynamos, 27-ton “Jumbos,” the largest ever built. The dynamos at the Pearl Street plant were then connected by copper wires running underground to other buildings whose owners had contracted with Edison for illumination. Laying Mr. Edison's electrical wires in the streets, 1882. The miracle of lighting by electricity had been demonstrated in New York, but throughout the nation the public held back, having heard reports of horses being shocked and workmen electrocuted. Insisting that electric light was clean, healthy, and efficient, not requiring the sprawling, foul-smelling facilities needed to provide gas for gas lighting, Edison staged an Electric Torch Light Parade where 4,000 men marched through Manhattan, their heads adorned with illuminated light bulbs connected to a horse-drawn, steam-powered generator. The marchers weren’t electrocuted, proving that electricity was safe, and the public was slowly won over. Hotels, restaurants, shops, and brothels soon became radiant with light. Darkness was banished and urban life transformed, and pickpockets could work in the evening. On September 13, 1899, Henry Hale Bliss, a real estate dealer, was struck by an electric-powered taxi while getting off a streetcar at West 74th Street and Central Park West, and knocked to the ground; rushed to a hospital, he died the following morning, the first such fatality in the nation. The taxi driver was arrested and charged with manslaughter, but was acquitted on the grounds of having exhibited no malice or negligence. All of which is a reminder that the Next Big Thing can bring perils as well as benefits. Installed on the centennial of the accident, a plaque commemorating his death now marks the spot. The International Exhibition of Modern Art, held at the 69thRegiment Armory on Lexington Avenue between 25th and 26thStreets, introduced avant-garde European art to Americans who were primarily used to realism, shocking them with a heavy dose of Fauvism, Cubism, and Futurism. Especially jolting to their eyeballs was Marcel Duchamp’sNude Descending a Staircase, No. 2, which expressed motion through a succession of superimposed images not of human limbs, but of conical and cylindrical abstractions in brown, a double blast of Cubism and Futurism. Organized by the Association of American Painters and Sculptors, this assemblage of 1300 works, including a fair number of nudes, was more than some could take. Accusations of quackery, insanity, immorality, and anarchy multiplied, parodies and cartoons mocked the show, and former president Theodore Roosevelt declared, “That’s not art!” But the civil authorities declined to close the exhibition down, and Americans began adjusting to the startling, radical, nerve-jolting, and precedent-shattering phenomenon that was modern art. It burst upon the nation when a tune called “The Charleston” ended the first act of the Broadway show Runnin’ Wild, and the all-black cast did an exuberant, fast-stepping dance that grabbed the audience, the city, and the nation, and then went on, some say, to become the most popular dance of all time. (But what about the waltz?) 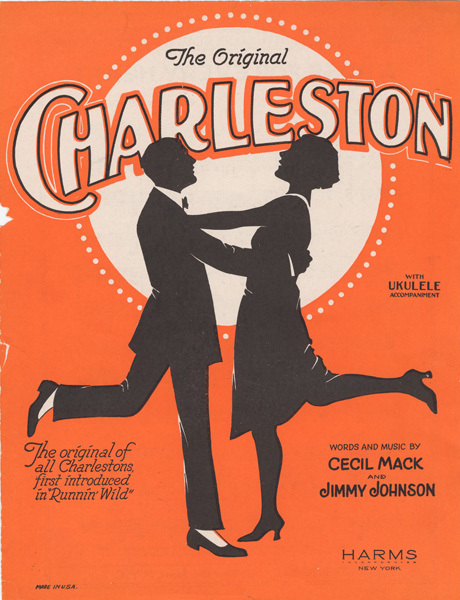 The song’s African American composer, James P. Johnson, had first seen the then-unnamed dance danced in 1913 in a New York cellar dive frequented by blacks from Charleston, South Carolina, who danced and screamed all night; inspired, Johnson then composed several numbers for the dance, including the one made popular by the musical. But the dance itself, which made the tango seem tame and the waltz antiquated, has been traced back to the Ashanti tribe of the African Gold Coast. The dance was brought to this country by slaves; after emancipation, African Americans seeking jobs in the North brought it to Chicago and New York, where Johnson discovered it, and the rest is history. 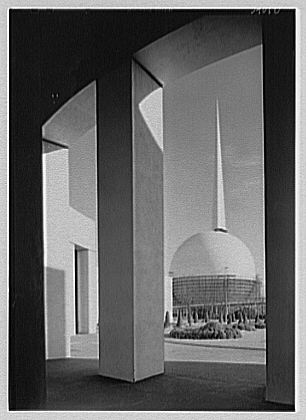 A view of the Trylon and Perisphere. Exhibits included the Westinghouse Time Capsule, a tube buried on the fair’s site and containing writings by Albert Einstein and Thomas Mann, copies of Life Magazine, a Mickey Mouse watch, a kewpie doll, a pack of Camel cigarettes, and other goodies meant to convey the essence of twentieth-century American culture. A Book of Record deposited with the Smithsonian Institution in Washington contains instructions for locating the buried capsule, instructions that will be translated into future languages with the passage of time. One indeed wonders what future generations, if such there be, will think of us when, if all goes as planned, they locate and open the buried capsule a mere 5,000 years from now. Also featured at the fair was Westinghouse’s Electro the Moto-Man, a 7-foot robot that talked and even smoked cigarettes; an appearance by Superman; a General Motors pavilion with an astonishing Futurama exhibit of the U.S. of tomorrow; an IBM pavilion with electric typewriters and a fantastic “electric calculator”; a Borden’s exhibit with 150 pedigreed cows, including the original Elsie, on a Rotolactor that bathed and milked them mechanically; Frank Buck’s Jungleland, with three performing elephants and 600 monkeys; a Billy Rose Aquacade with synchronized swimmers; and a Salvador Dalí pavilion with scantily clad performers posing as statues. This and some neighboring girlie shows prompted complaints, and the New York Vice Squad on occasion raided the Amusement Area, but these tributes to the world of today were never quite shut down. As for the World of Tomorrow, some of it, such as robots and computers, has come to pass, but a lot has not, showing once again the near impossibility of accurately predicting the future. On February 7, 1964, the now legendary foursome, then newly popular in Great Britain, arrived at New York’s Kennedy Airport, where, to their astonishment, they were greeted by 4,000 fans held back by police barriers, and – just as important – 200 journalists. Intensifying anticipation of their arrival were five million posters distributed throughout the nation to announce their coming, and the phenomenal success of their song “I Want to Hold Your Hand,” which had sold a million and a half copies in just three weeks. Grinning and waving cheerily, the lads from Liverpool were immediately subjected to a chaotic press conference where they played the journalists for straight men. “What do you think of Beethoven?” one reporter asked. From left to right: John Lennon, Paul McCartney, George Harrison, and Ringo Starr. Greeting fans at Kennedy Airport. After an hour of this banter they were put into limousines, one per Beatle, and driven into the city to the sumptuous Plaza Hotel at Fifth Avenue and Central Park South, where a ten-room suite on the 12th floor had been reserved for “four English gentlemen.” The sedate Plaza didn’t know what had hit it, as Beatles fans – mostly hysterical young women – ran against traffic to the hotel, eager to get even the barest glimpse of the Fab Four in their collarless sleek mod suits, their young faces topped by pudding-bowl haircuts called “mop tops” that provoked much comment, not all of it positive, from the press. BEATLES 4 EVER proclaimed an outsized sign that the fans held aloft, as they chanted “We want the Beatles” and screamed and wept, and sometimes fainted from excitement. Their idols reveled in the hotel’s luxury but felt besieged, their suite guarded by round-the-clock guards. Two large cartons addressed to the Beatles arrived at the hotel, but proved to contain two female fans who, being detected, never reached their goal. Another sixty got as far as the 12th-floor stairwell before being caught and expelled. Briefly eluding their fans, the boys were soon riding in Central Park in a horse-drawn carriage, staring in wonder at the city, and Ringo was photographed dancing the night away with singer Jeanie Dell at the Headline Club. But this was mere prelude to their first U.S. TV appearance on the Ed Sullivan show on February 9, which was watched by an estimated 73 million viewers, this blogger among them, though their music was barely heard over the screams of the teenage girls in the audience. Continuing their ten-day tour, on February 11 they gave a concert at the huge Coliseum in Washington that was attended by 20,000 fans, then the next day gave two back-to-back performances at Carnegie Hall in New York, where fan hysteria caused the police to close off the surrounding streets. After more concerts, on February 22 they flew back to England, allowing a semblance of normality to return to this city and the whole East Coast. Meanwhile their singles and albums were selling millions of records, and their first feature-length film, A Hard Day’s Night,was released in August 1964, a gentle spoof of the whole scene that this blogger much enjoyed. And later that month, to capitalize on the Beatlemania now raging in the U.S., the foursome returned for a second tour and played to sold-out houses across the country. Some critics scoffed and quibbled at their music, but it hardly mattered; by now the foursome had the young audience firmly in their grip. The renowned conductor Leopold Stokowski, commenting to an audience of his own at Carnegie Hall, complained that the Beatles’ music, which he happened to like, was drowned out by the teen audience’s screaming. “If you can’t hear them,” he asked, “why are they so great?” The answer came at once from a red-headed girl in the audience: “Because they’re cuties!” As for the older set, they were probably relieved, in that age of strident youthful rebellion, to encounter four likable twenty-somethings who didn’t threaten anyone. And the twenty-somethings raked in millions. So what today will be the Next Big Thing? Driverless cars? Robot-operated factories? A cure – a real cure – for cancer? Life on Mars? Some crazy new dance? Your guess is as good as mine. But this much is certain: sooner or later it will come, and when it does, it will astonish, madden, and excite. with the worst depression in the nation's history. Coming soon: New York and the Slave Trade: a shameful chapter in the city's history.